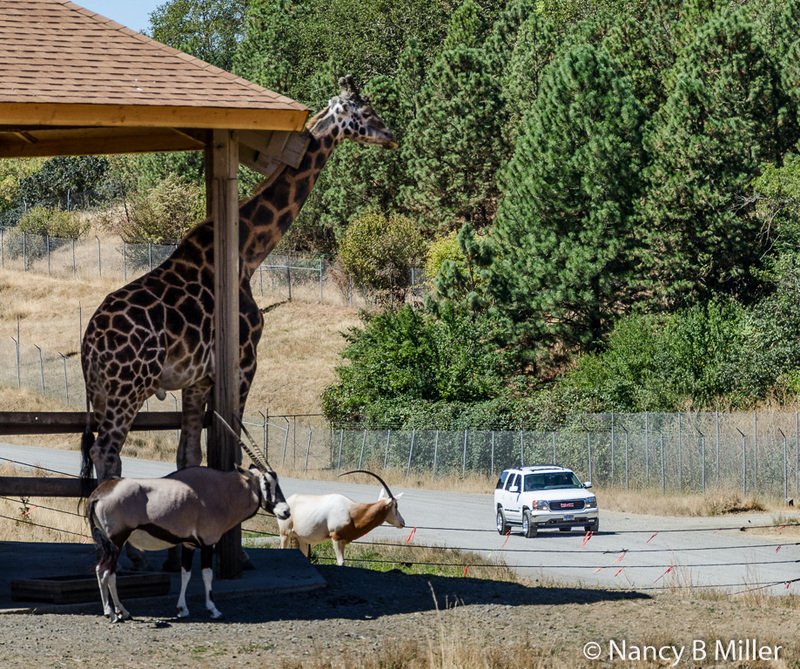 One family attraction for animal lovers definitely worth visiting is Wildlife Safari in Winston, Oregon. Located at I-5 exit 119, labeled Winston, six miles from Roseburg, it’s easy to reach. 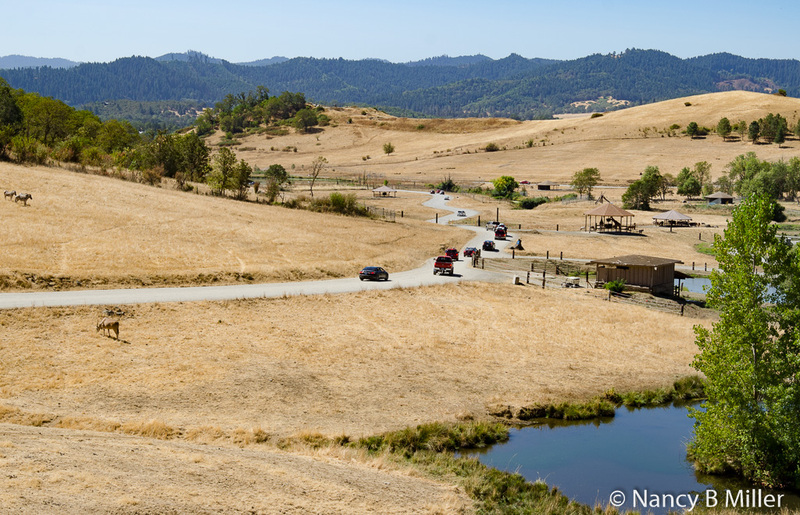 On its 600 acres, you’ll find a drive-thru expedition, close up animal encounters, a petting zoo, and more. With more than 550 animals, covering 90 species, primarily from Africa, Asia, and the Americas, it’s a place where you’ll want spend a full day. We did. We first met with Tammi Ellison, Marketing Director, who gave us an overview and history of their facility. Frank Roland Hart started Wildlife Safari in 1972. He was a successful businessman who worked for Walker and Lee, one of the nation’s leading residential real estate firms. On his first trip to Africa in 1963, he instantly became fascinated with that continent, leading to a total of 40 trips there. With each trip, his love for the area and it’s exotic wildlife grew. Other travels led to India, Greece, Indonesia, and Europe and an increased desire to help sustain the world’s wildlife. He convinced his employer, Walker and Lee, to develop 600 acres for a large reserve, housing animals from all over the world, in a natural setting resembling African and Asian terrain. Wildlife Safari opened in the spring of 1973. In 1980, it reorganized as a nonprofit. Funding depends on admissions, donations, memberships, and grants. There is no tax support to provide for the many animals it serves. “It costs $11,000 a day to care for the animals,” Tammi told me. Wildlife Safari received accreditation from the Association of Zoos and Aquariums (AZA) in 1986 and still holds this designation today. It’s one of only three organizations in Oregon to have this distinction, along with Oregon Zoo and the Oregon Coast Aquarium. Today, it has become a leading Oregon attraction hosting more than 170,000 visitors a year. Besides entertaining its guests, Wildlife Safari has become known for educational outreach programs and for its internationally known veterinary program which trains about 60 people annually. Of these 60, about 15 are international students from all over the world. The staff works with the Veterinary School at Oregon State University to accomplish this. It’s a one to two week elective course for fourth year students, offering them the opportunity to learn wildlife veterinary medicine under the stewardship of Wildlife Safari’s vet. 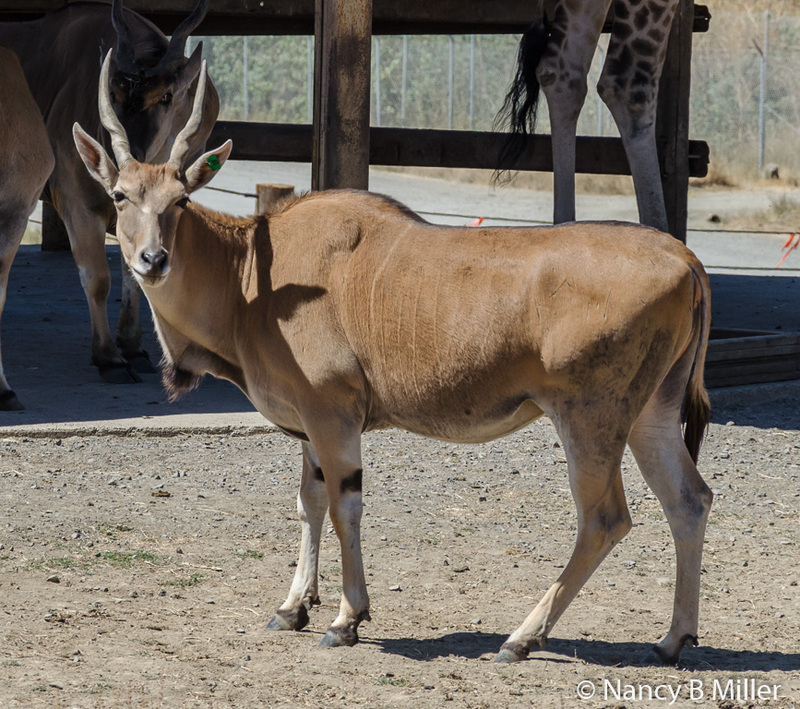 Endangered species breeding programs are a priority at Wildlife Safari. Significant ones deal with hippos, lions, elephants, lemurs, tigers, white rhinoceros, Cotton-top mandarins, and the maned wolf. The Cheetah Reproductive Project is the most successful program of its type in the Western Hemisphere. Since 1973, it has produced 176 cubs and counting. Through the AZA Survival Plan for cheetahs, cubs born at the park have populated zoos across the United States. Wildlife Safari recently participated in a three-year project with AZA zoos holding elephants. It studied the welfare of elephants under human care. Results are ongoing. The Elephant Outpost Waterhole provides visitors an opportunity to see elephants up close. Visitors can go to Tembo Trek, a meeting place near the waterhole. There they can sit and learn about these majestic creatures via keeper talks and demonstrations. This event was held at 2:30 p.m. for $15 a person the day we were there. It had to be booked at Guest Services. Added to Wildlife Safari in 2014, the area includes an underground tunnel and cave, a waterfall, a pool, and a sand play-yard for the elephants. We learned of other ways to spend time with the animals close up to observe their behaviors. The following was the daily schedule when we were there in August. The extra price was on top of the Drive-Thru admission. U-Feed Giraffes were scheduled at 1:00 and 2:00 p.m. with the U-Feed Bear at 11:30 a.m. and 3:00 p.m. Both of these events cost $15 a person. An option was attending the Tiger Tour at 10:30 a.m. or Hippo Encounter at 2:30 p.m., each for $12 a person. 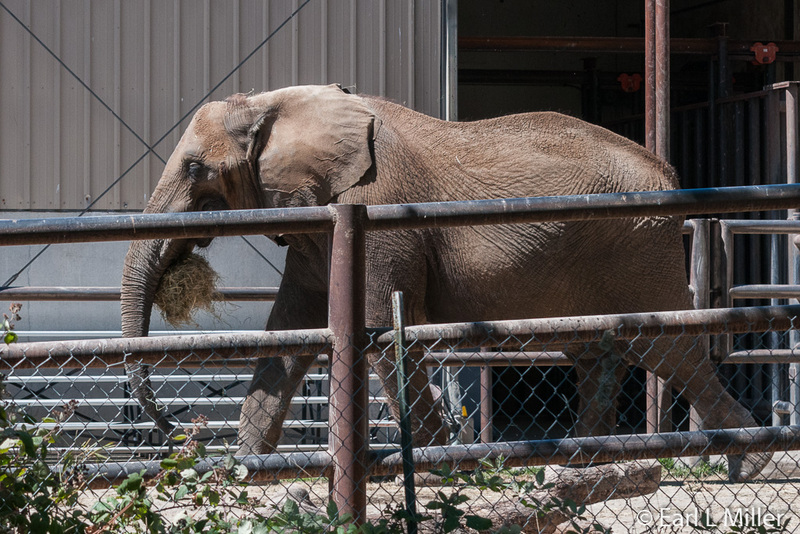 An elephant encounter took place at 1:30 p.m. for $15 a person. 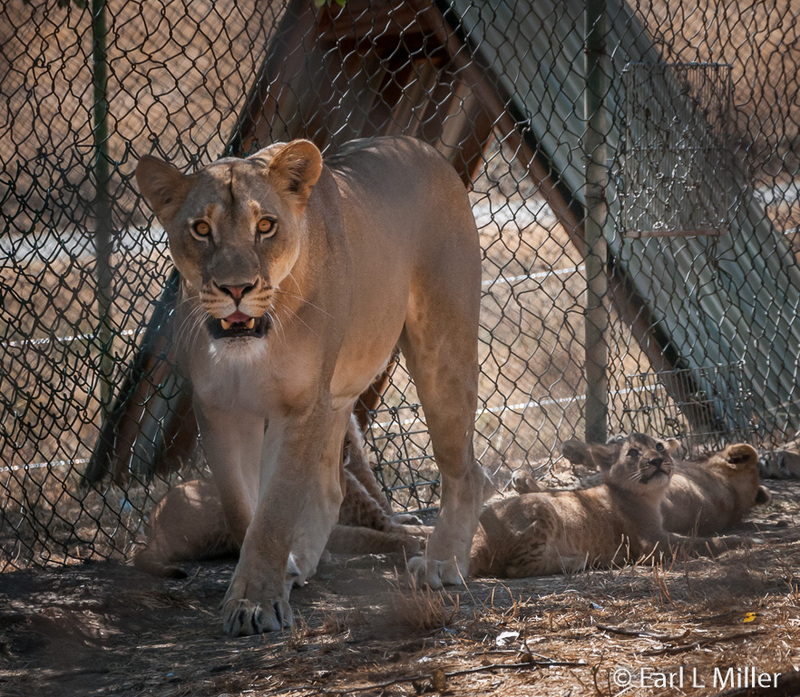 We went at 2:00 p.m. (Also scheduled at 11:00 a.m.) to Lion 101 to see the new cubs. These could be obtained for $12 a person. 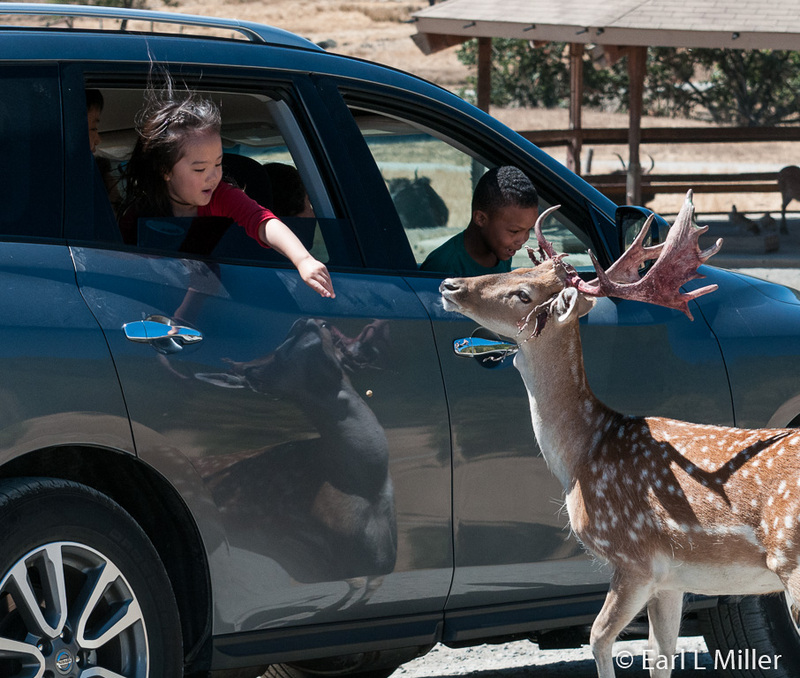 Other animal encounters, ranging in price from $45 to $120, were also available. These included a painting by a cheetah or tiger for $55. At Pachyderm Picasso, you could purchase a painting by an elephant for $225. You could feed a bear for $75 a person or do the Cheetah & Tiger Feed Combo for $125 per person. The schedule changes based on the time of year and the animal needs. So it’s best to check the literature you are handed for the day’s events. 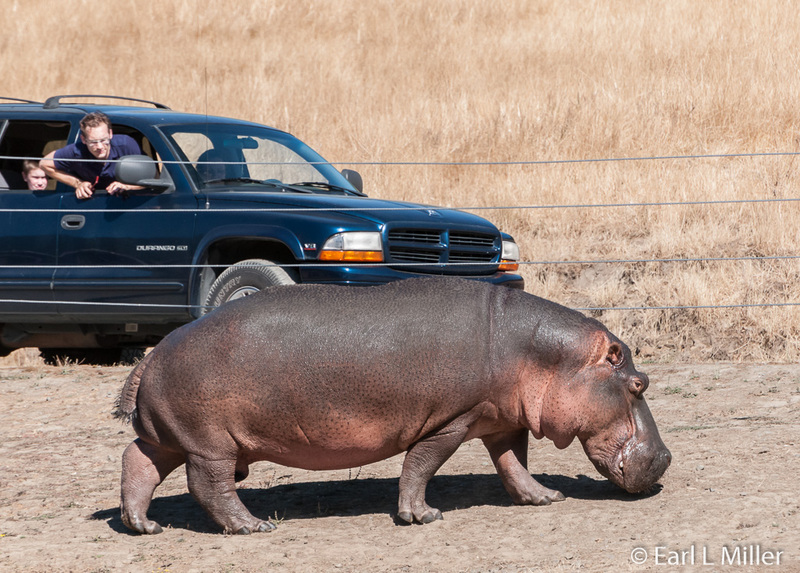 Optional encounters can also be viewed on the Wildlife Safari site, http://www.wildlifesafari.net. For more details or to make reservations for these, call Guest Services at (541) 679-6761. 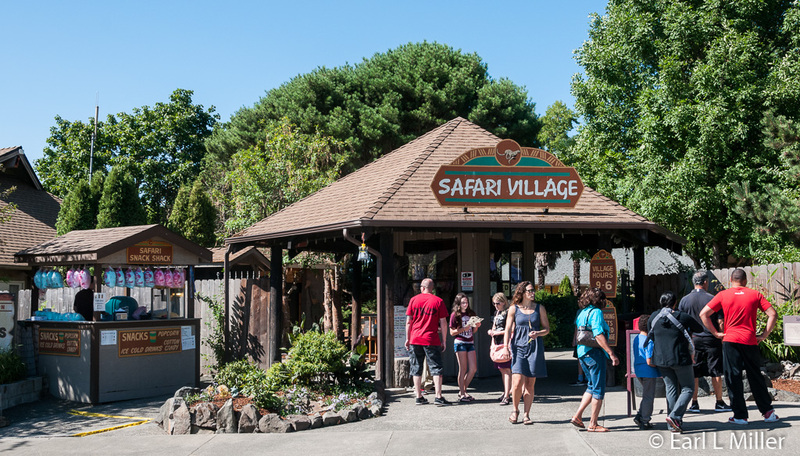 The Safari Village, which is always free to the public, houses more than 90 other animals including cougars, primates, reptiles, insects, and birds. It’s the home of the white rhino, Flamingos, Red Billed Hornbills, a cheetah area, and the Australian section with wallabies and Kookaburras. It also houses an Indian Crested porcupine, a Sulcata tortoise, Cotton Top tamarins and an American Eagle. 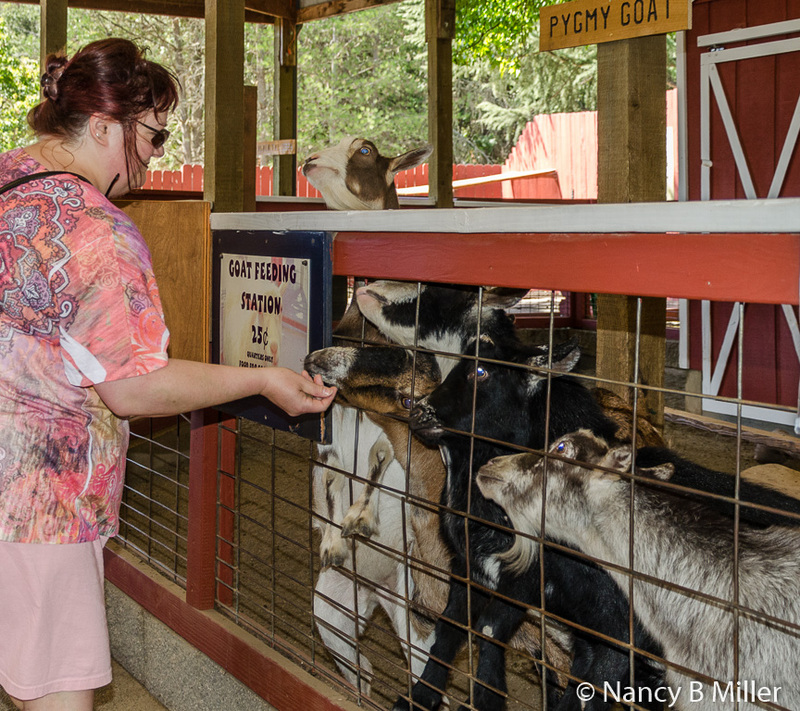 In this area, you’ll find a Children’s petting zoo with pygmy goats, a miniature donkey, and a miniature horse. The goats are excellent in seeking out whether you have purchased the available pellets for them. 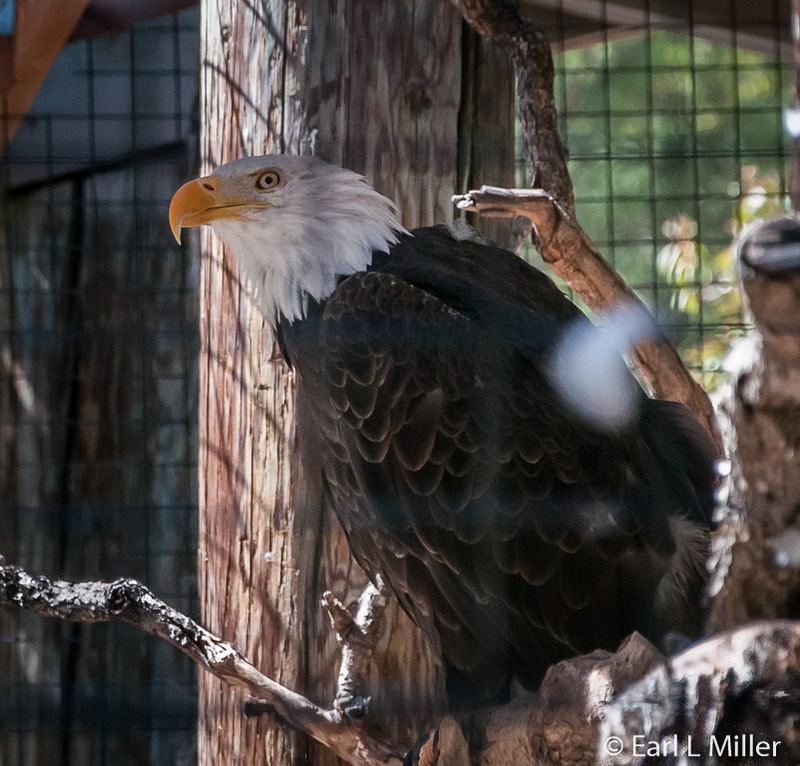 American Eagles were recently reclassified from endangered to threatened. The number has climbed from 416 nesting pairs in 1963 to about 4,000 today. When they are old enough to breed, they often return to the area where they are born. While it is thought that they mate for life, if one pair member dies or disappears, the other will choose a new mate. 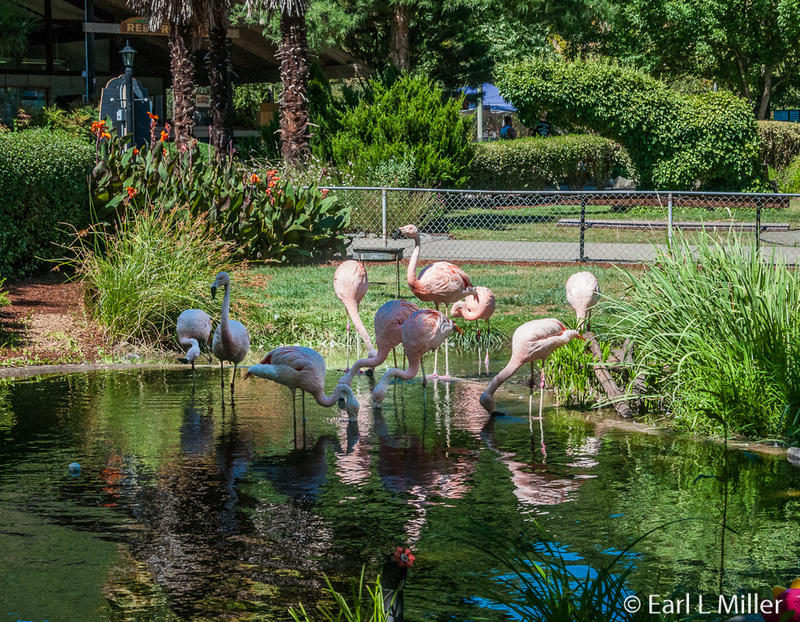 Flamingos are native to South America. They retain their coloration from the shrimp and algae they eat. Very social animals, they do everything in large groups. The cheetah is the Wildlife Safari signature animal. Look for the Safari Village Cheetah Spot, the large compound up front. 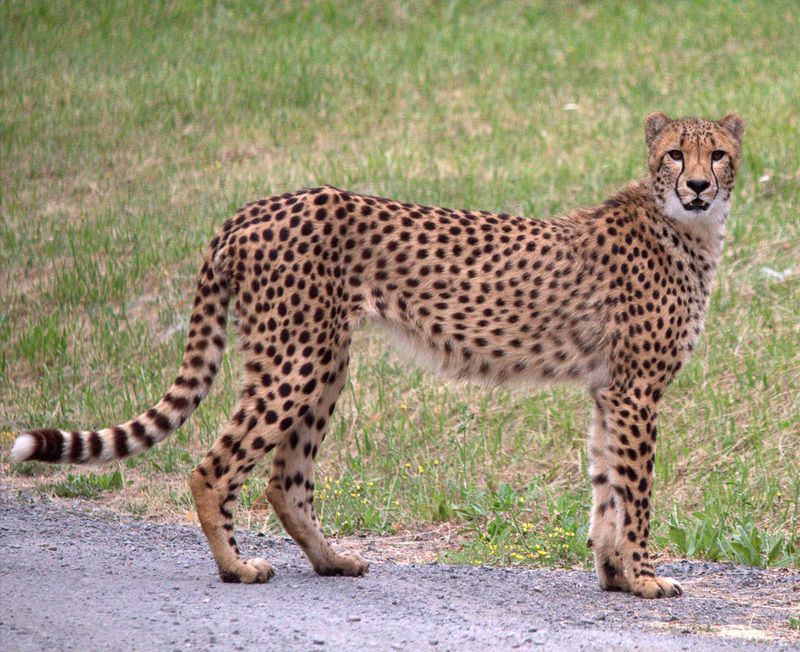 The cheetahs also have an off-exhibit breeding area adjacent to the drive-thru compound. These areas mimic the cheetah’s terrain found in Africa, south of the Sahara. Trained volunteers spend hours watching and recording each cheetah’s behavior. Via this data, consistent behavior linked to breeding can be determined. They are the world’s fastest land animal sprinting at speeds of 65 to 70 m.p.h. Less than 10,000 remain in the wild due to loss of habitat, human population growth, illegal hunting, and predation so the work Wildlife Safari is doing is extremely important. This picture of the cheetah was provided by Wildlife Safari. A free Village Show is held at 1:00 p.m. on Saturday and Sunday. It’s an educational show featuring small animals from the village. It’s traditionally held in the dome during the warmer months, like the summer. During Wildlife Safari’s Harvest Zoobilee event and the Wildlights Holiday Events, the show is an actual on-stage production in the theater featuring animals and keepers in a scripted play. From spring through fall, weather permitting, you can take a Safari Village train, the Uganda Express, through part of Safari Village. The Safari Gift Shop is open all year and is a great place to shop for animal related items. I recommend for $7 purchasing their Wildlife Safari Guidebook which provides photos and lots of facts about the animals you’ll be seeing. We had lunch at The Safari Village Café. Offering items such as sandwiches, hamburgers, soups, and hot dogs, we found it a reasonable place to buy a light lunch without leaving to go into nearby Rosburg. A highlight is that it overlooks Primate Island housing gibbons. 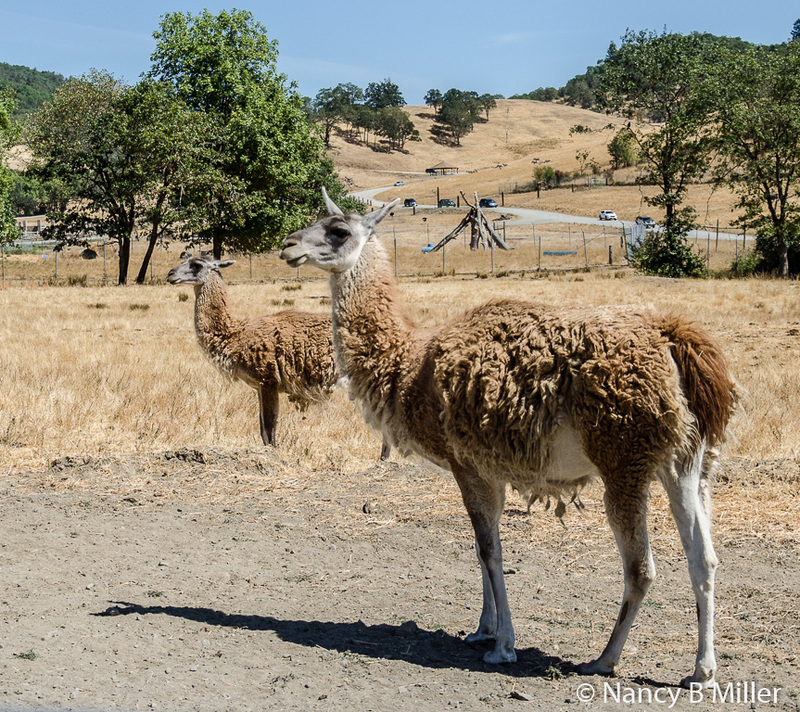 As you follow along the 4.5 mile drive-thru area, you see a wide range of animals interacting with each other. You’ll want your cameras available at all times. 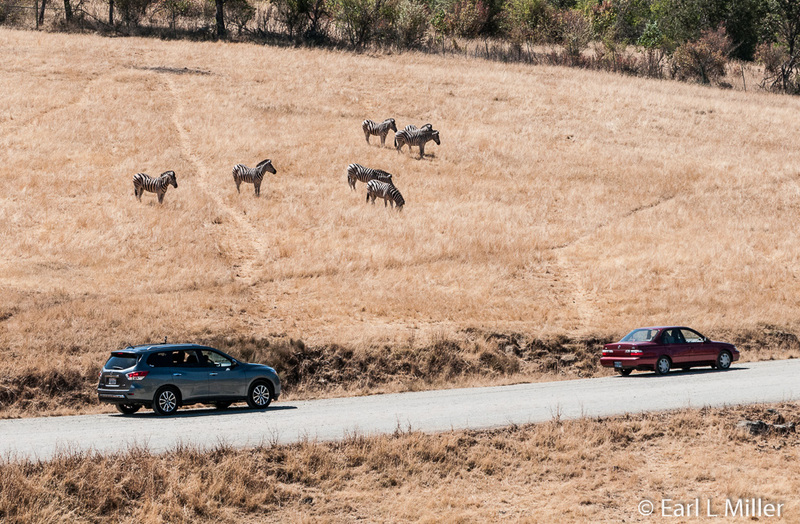 You’ll travel slowly along the road, stopping frequently to observe the animals displaying natural behaviors. No motorcycles or open top vehicles are allowed, and convertibles must have their tops up at all times. No pets are allowed in the village or drive-thru area either. Pets gain the attention of other animals. This could endanger the lives of guests and park personnel and result in damage to vehicles. Wildlife Safari does make kennels available for visitors’ pets. Paid admission allows you to drive-thru twice. It’s $17.99 for adults, $11.99 for children ages 3 to 12, $14.99 for seniors age 60 plus, and free for those less than two years of age. We enjoyed seeing and learning about the vast variety of animals. On our two drives, we saw mostly the same species. However, we also observed various behaviors displayed by the same animals. The best times to drive through to see more activity are in the early morning and the late afternoon. First, we drove-thru the African section. 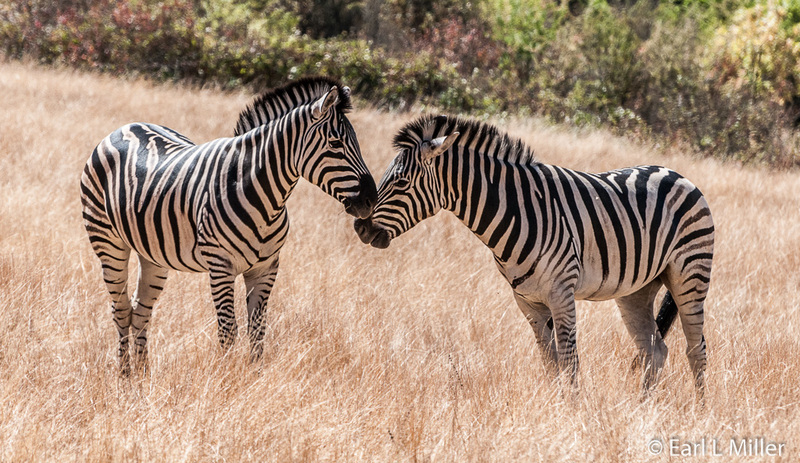 We saw a herd of zebras and learned a zebra’s striped coat serves several purposes. It’s an original fingerprint for these animals providing individual recognition among herd members, serving as camouflage, and aiding in protection against disease carrying insects like the tse-tse fly. There are three types of zebras: plains, mountain, and Grevys. 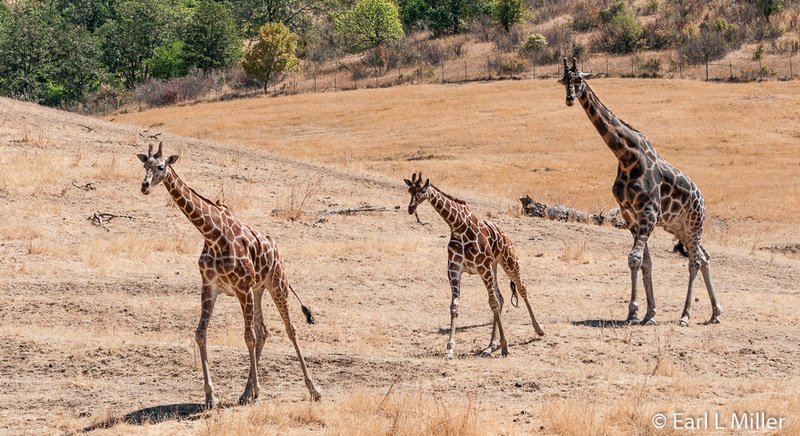 Wildlife Safari has two types of giraffes - the Reticulated and Rothschild’s. The Rothschild’s coat has medium brown splotches compared to the Reticulated giraffe’s reddish brown ones. The Rothschild giraffe is also taller. At 15 to 17 feet tall, giraffes are known as the sentinels of the African grasslands. Giraffe bones can be ten inches high. Only seven vertebrae are in the neck. Their black tongues can be more than 18 inches long and are used to gather food into the mouth. The feeding behavior is so characteristic that giraffes can be sexed from a distance by observation only. Females feed at body or knee height with their necks curled over while males feed with their neck and head at full vertical stretch. 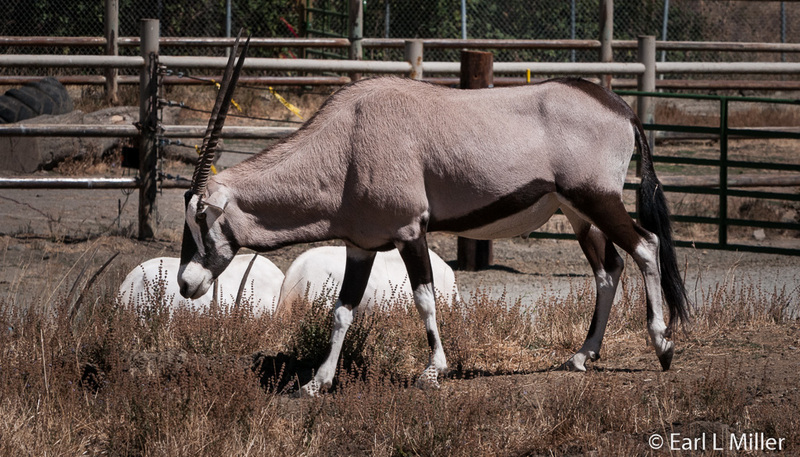 Oryx gazelles, also known as Gemsbok, use their long spear-like horns in dominance fights. They are experts at finding even the smallest water sources. They dig deep holes in dried-out river beds to reach ground water as well as dig up fruits and roots containing water. 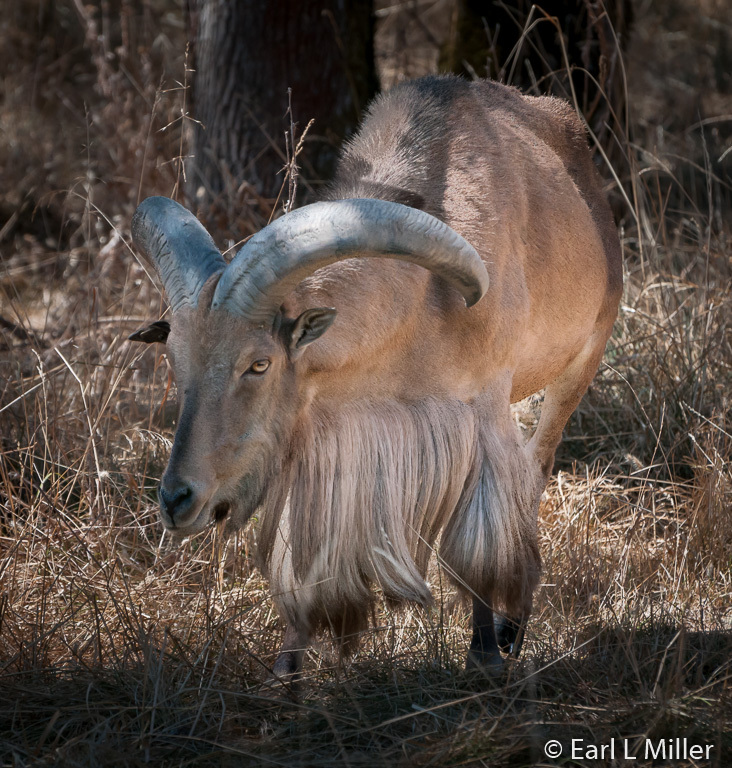 Cape Elands are the world’s largest antelope. They stand up to 11 feet and weigh 2,200 pounds. In Africa, you can see herds of 200 on the open savanna plains. A way to spot them is by their loose skins hanging under their necks and by the white stripes on their flanks. Because of their likeness to cattle, many attempts have been made to domesticate them. We saw a Southern White Rhinoceros wandering around. These are only second to the elephant in size as can weigh up to 8,000 pounds. 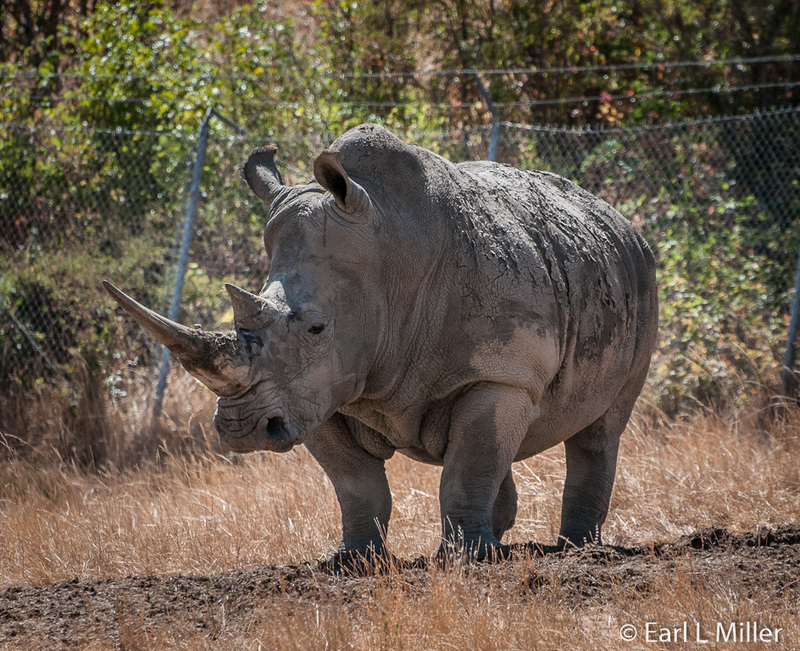 The white rhino is not named for the color white but for the African word describing its mouth “weit” meaning wide. Rhinos are the only animals on earth with horns on their noses. This feature has led to man poaching thousands of them, pushing all five of their species close to extinction. Their number has stabilized at 15,000 because of protected reserves. Wildlife Safari is a rhinoceros breeding facility. 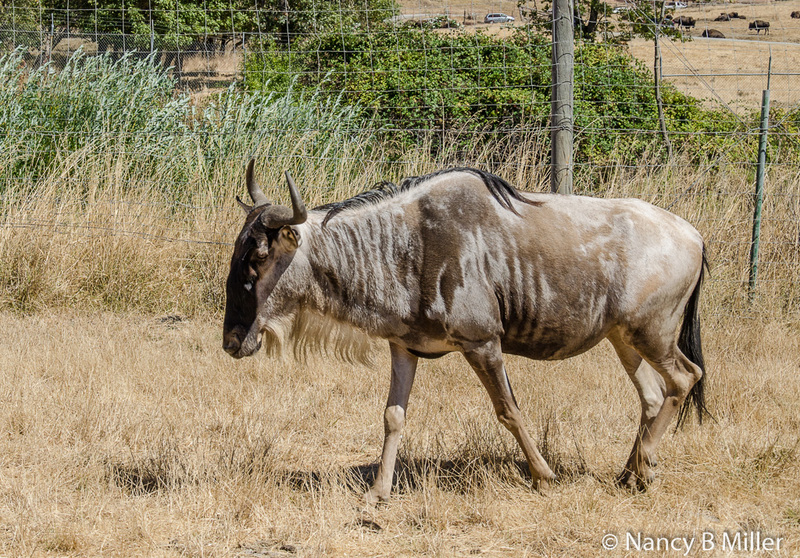 White Bearded Wildebeest or gnus are at home on the Serengeti in Africa where they are known for their mass migrations. They look like they have been put together by a committee. They’re somewhat cattle-like, horse-like, and antelope-like with a beard of white hair at the neck. The Barbary sheep literally has a combination of sheep and goat characteristics. They are called “maned jumpers” because of their ability to jump and for their long, apron-like bibs of hair extending down their neck, chest, and forelegs. They’re the only sheep in Africa and are now a threatened species. They are illegally hunted for their meat, hide, hair, and horns. Elephants are the largest of all land animals. Two types exist: Asian and African. Most of Wildlife Safari’s elephants are African. They did bring their first Asian elephant to the park in 2014. You can tell the African as they are larger than the Asian and their ears are shaped like the African continent. Both sexes have tusks. Elephants consume 300 pounds of plant matter and drink 50 gallons of water daily. Once counted in the millions, they now fluctuate between endangered and threatened because of habitat destruction and poaching. They are included in a species survival plan to manage their breeding in captive populations in the United States. We also saw a few lions, the most social of the big cats. Their number has dwindled to less than 20,000 in the African wilds and only around 300 of the Asiatic lions exist in India. This is due to habitat loss and decline in the population of wild prey. Females hunt, often in groups, for prey at dawn and dusk. Once prey is taken, the males drive the females away from the kill selecting the choicest bits for themselves. Watusi tribesmen domesticated Watusi Cattle 7,000 years ago. These “Cattle of the Kings” are indications of tribal wealth and prestige. They’re found in the grasslands of eastern Africa. Their horns, measuring five feet in length, are found in both sexes. 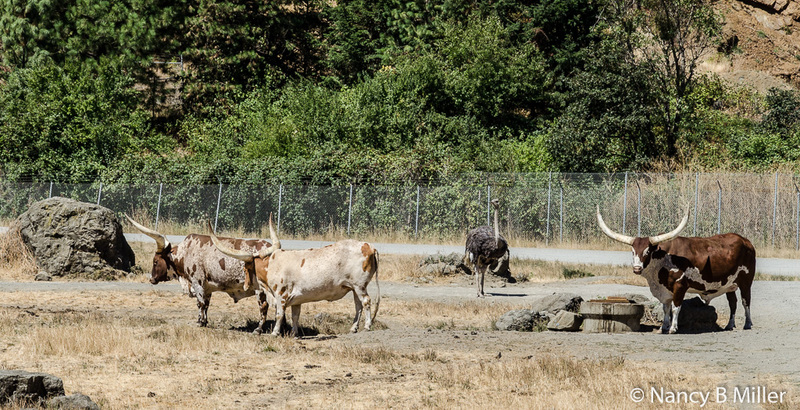 They’re the longest horns of any breed of cattle in the world. Hippopotamuses are found exclusively in Africa. They are the only large land mammals not threatened. They are hunted for their meat. Their canine teeth, which can grow up to 1-1/2 feet are highly prized as “Ivory.” They are considered dangerous and kill more people in Africa annually than any other animal. They rest in water during the day and spend most of their nights grazing on land. On our second drive through we saw a mama Ostrich trailed by her babies. The ostrich is the world’s largest bird weighing up to 300 pounds and standing eight feet tall. With their height and keen eyesight, they can spot predators such as lions and cheetahs from a great distance. They can flee from danger at 40 m.p.h. They lay 15 three to five pound eggs a year, the world’s biggest egg measuring eight inches. It’s a myth that they bury their heads in the sand. They peck for food in tall grasses and also rest their heads and necks on the ground while lying down. In the North American section, we saw Guanacos which are related to alpacas, camels, and llamas. They can survive for a long time without water and can inhabit high elevations. They live in loosely formed social groups. We saw Roosevelt Elk but unfortunately these were camera shy and would not come out of the shade. Also called “Wapiti,” they are found in northwest coastal areas ranging from Canada to northern California. The male’s antlers can reach a maximum length of more than five feet. 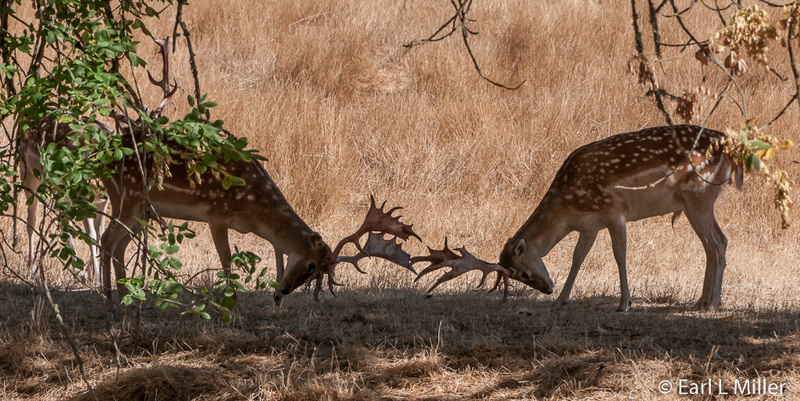 During the fall mating season, males compete for a harem, fighting several battles before the rut is over. We saw numerous bison gathered together, some with calves. Babies have light-reddish coats which darken as they mature. 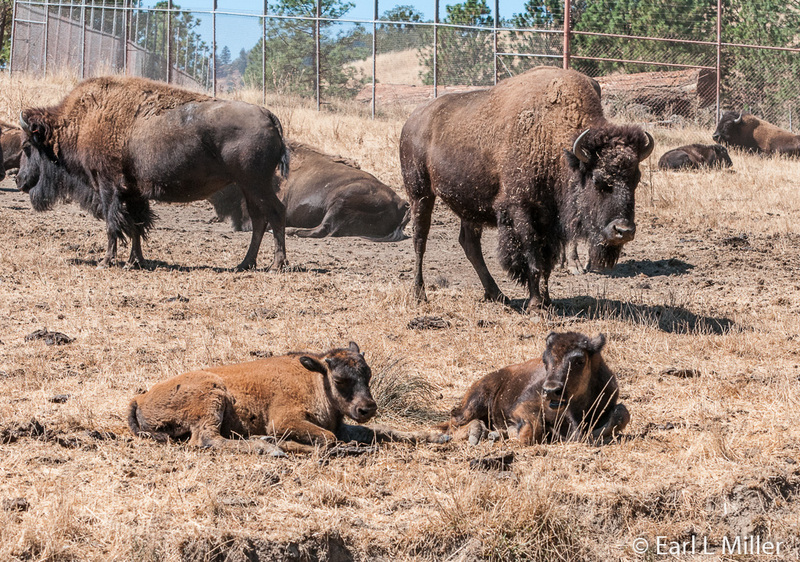 Because they were viewed as a menace to crops and an obstacle for the railroads, bison were almost eliminated. Between 1870 and 1875, 2-1/2 million bison were killed annually. By 1891, only 541 remained. Due to conservation efforts, since the early 1900's, their populations have increased. They’re found in national parks, wildlife refuges, and private ranches. On our two drives around the park, we noticed several bears - both black and brown. Black bears are found from Alaska to southern California and east to the Great Lakes. Brown bears once covered that territory but now exist in small pockets scattered across the northern U.S.
Brown bears can be reddish-yellow, silver-gray, pale cream, or black as well as brown. They are much larger than black bears and are ground dwellers. Black bears like to climb trees. They have shorter hair, a more convex face and snout, and shorter, more curved claws than brown bears. 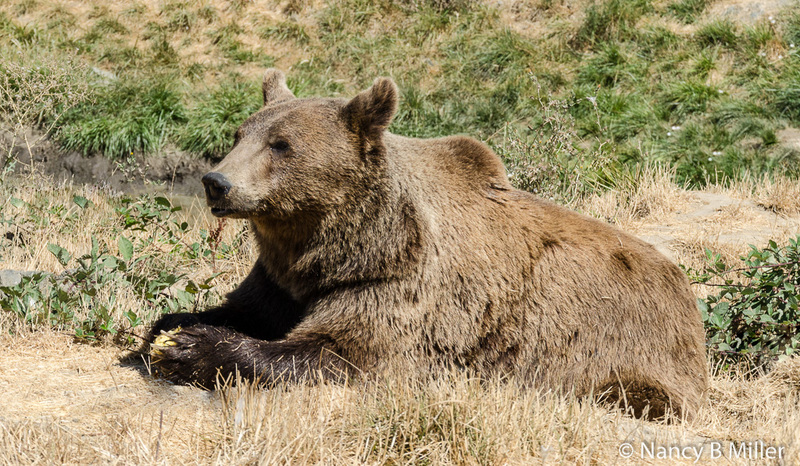 Bears at Wildlife Safari hibernate from November through February. All of this attraction’s bears came to the park as rescued or orphaned cubs. They are playful, curious, and not afraid of vehicles. 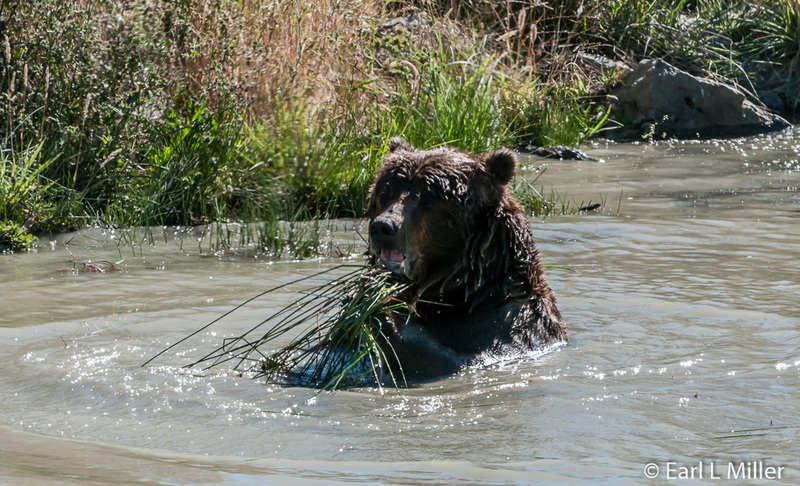 On our first drive, the brown bears had headed for the pond and seemed to be enjoying the water thoroughly. During our second drive, they were strolling around on land. We also drove through the Asian section where we spotted and photographed more species. 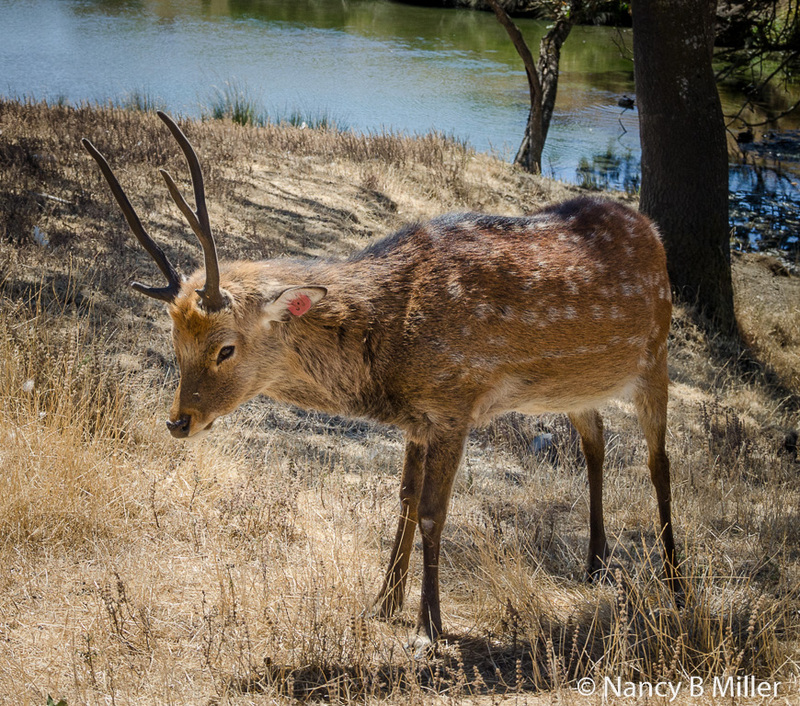 Sika Deer are native to Japan. They retain their spotted coats even when fully mature. We saw drivers purchasing food for them and feeding them directly from their cars. 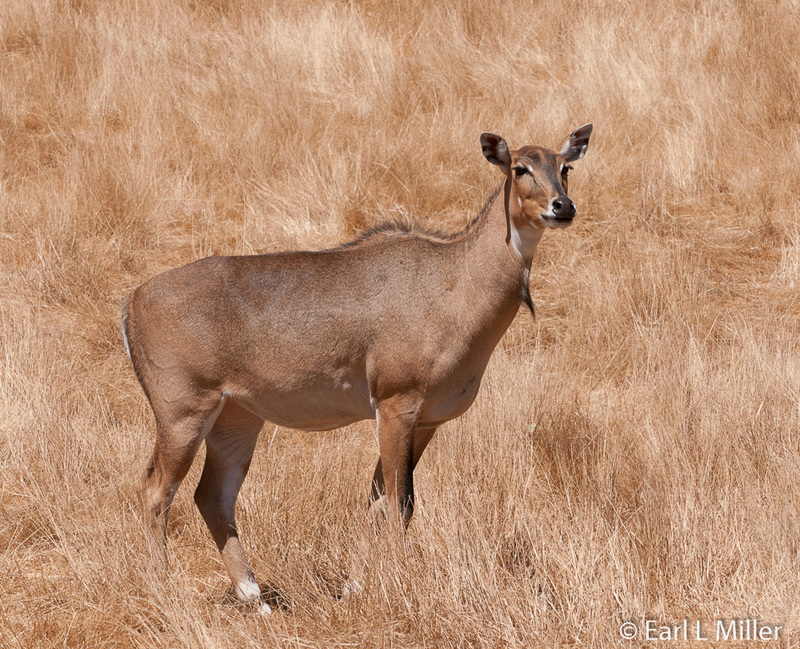 Native to India, Hindus regard Nilgai as relatives to the sacred cow. Their name means “blue bull” which refers to the grayish blue color of mature males. Females remain brown. Nilgai rest on their “knees” while grazing and stand on their hind legs, for short periods, to feed on leaves and shrubs. 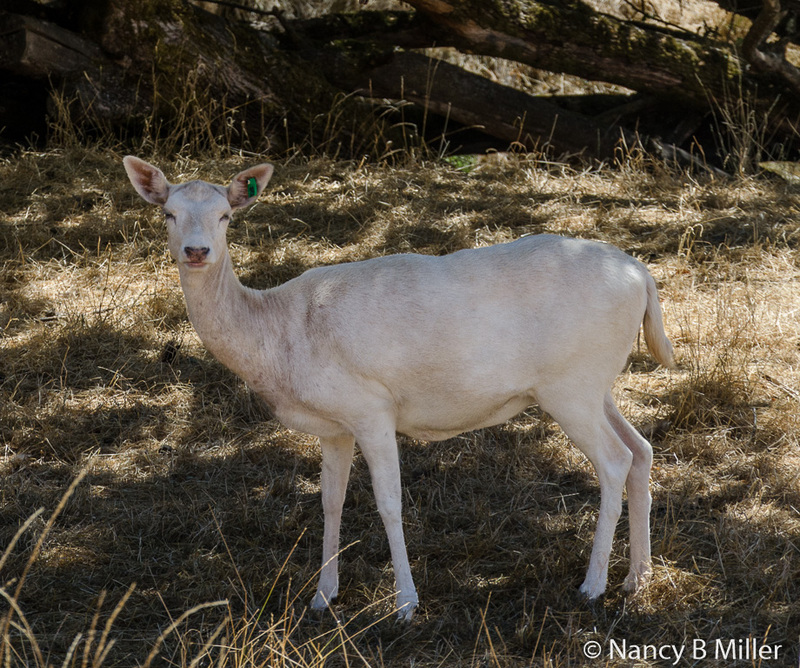 The ancient Romans introduced White Fallow deer to central Europe. Males have antlers that are similar to those of the moose. In the wild and Wildlife Safari, the sub-dominant males form bachelor herds, particularly in the spring and summer when the young are born. Babies have a light brown coat so they can hide more easily in the grass. These lighten as they mature. 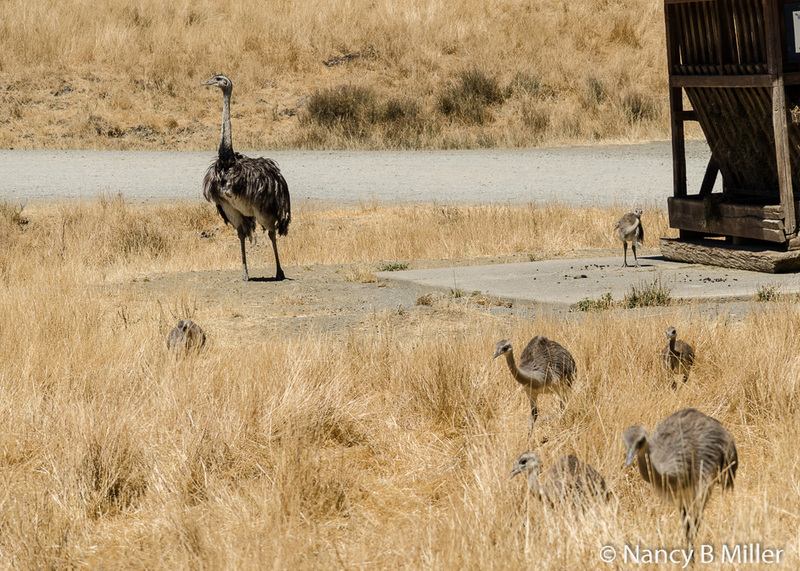 Besides these species, this area is home to Rheas, Emus, Egyptian Geese, and White-Naped Cranes. You’ll also spot the Blackbuck, which looks like a deer with a white belly, and the Tibetian Yak, which is nearing extinction.